Dante Gabriel Rossetti (1828–1882), Lucrezia Borgia (1871), watercolour and gouache with heavy gum varnish on cream wove paper, 64.2 x 39.2 cm, Fogg Art Museum, Harvard University, Cambridge, MA. Wikimedia Commons. Mention the surname Borgia and most people conjure up sinister connotations. Add the Christian name of Lucrezia and we recognise one of the classical femmes fatales, famous from books, movies, and art. This article looks at her portrayal in paintings. Her father was Cardinal Rodrigo de Borgia, later to become Pope Alexander VI, and her mother was one of his several mistresses, apparently kept discreetly outside the city of Rome. She was born on 18 April 1480, and received an unusually broad education, becoming proficient in four main languages, as well as being able to read Latin and Greek. Before she was even eleven years old, marriage was arranged for her, first with a Valencian noble, then with the Count of Procida. After he father became Pope, that was changed again to a second-rank count in the House of Sforza. Lucrezia married him when she was just thirteen, for the Pope’s political gain. The Sforzas soon became of no interest to the papal court, so the Pope ordered her husband’s execution. Lucrezia warned him, which enabled him to flee, and the marriage to be annulled on the basis of it not being consummated. That at least spared him his life. It is generally thought that, whilst awaiting the annulment, Lucrezia had an affair which resulted in her pregnancy, and the birth of a son, Giovanni Borgia, although two papal bulls were issued contradicting that, and one another. When she was eighteen, Lucrezia was married a second time, to Alfonso d’Aragon, the Neapolitan half-brother of her brother-in-law. 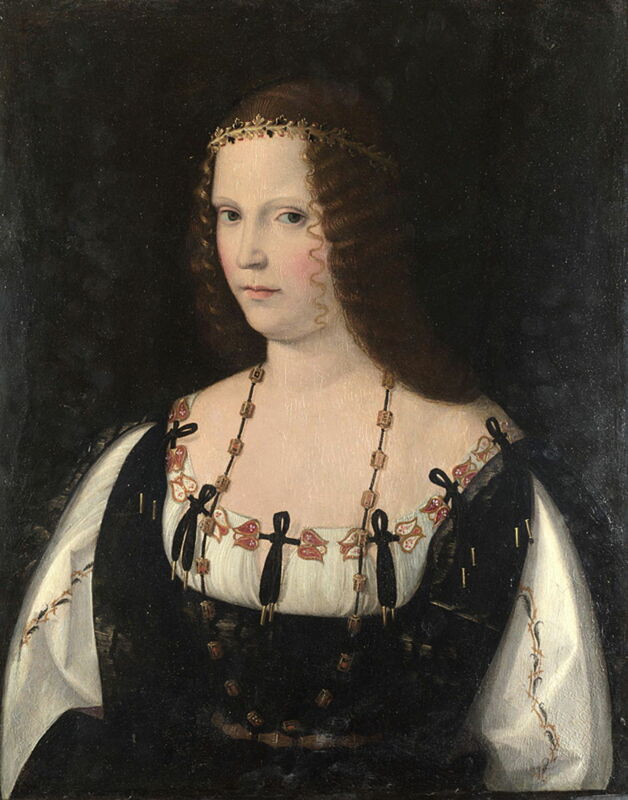 The following year it was she, rather than her husband, who was appointed governor of Spoleto, and a year later, in 1500, her husband was murdered, apparently on the orders of Lucrezia’s brother Cesare because of changing political allegiances. Her father, the Pope, then arranged a third marriage, to Alfonso d’Este, the Duke of Ferrara, which proved more lasting and productive of eight children. However, neither husband nor wife was in the least bit faithful: Lucrezia had a long and very physical affair with her brother-in-law Francesco Gonzaga, the Marquess of Mantua, which he had to terminate when his syphilis became too overt to hide any longer. Lucrezia also had a more emotional affair with the poet Pietro Bembo, who is now commemorated in the font of that name. She fell seriously ill after the birth of her tenth child in June 1519, and died on 24th of that month. Dosso Dossi (Battista Dossi) (c 1486-1541/2) (attr), Lucrezia Borgia, Duchess of Ferrara (1519-30), oil on wood panel, 74.5 x 57.2 cm, National Gallery of Victoria, Melbourne, Australia. Wikimedia Commons. The closest that we have to a portrait of Lucrezia is this panel which is attributed to Dosso Dossi, and claimed to show Lucrezia Borgia, Duchess of Ferrara from some time between 1519-30. Inevitably that remains a matter of dispute, and doesn’t match contemporary descriptions of her having very long and thick blonde hair. 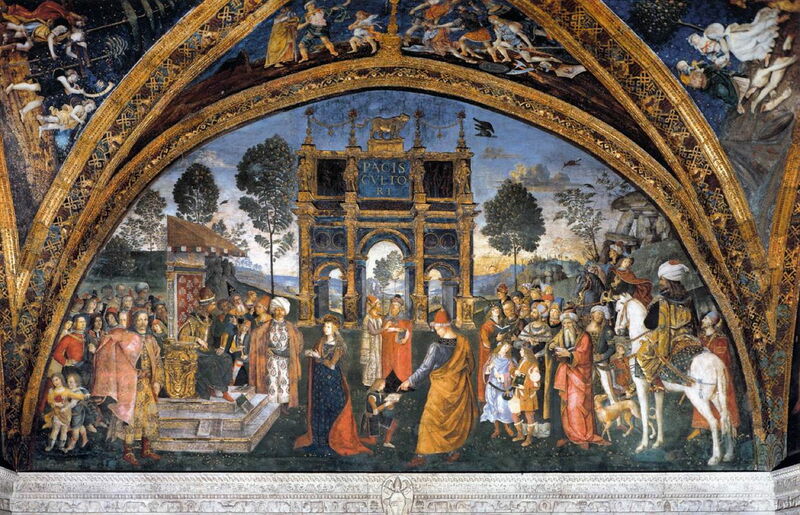 Pinturicchio (1454–1513), St Catherine’s Disputation (1492-94), fresco with gold leaf, dimensions not known, Appartamento Borgia, Palazzi Vaticani, Vatican City. Wikimedia Commons. It has been proposed that Lucrezia modelled for the title role of Pinturicchio’s wonderful fresco of St Catherine’s Disputation in the Borgia Apartments in the Vatican Palace. She would therefore be the woman wearing a red cloak over a patterned blue dress to the left of the centre foreground. As this was painted between 1492-94, she would only have been 12-14 at the time, and in the throes of her first marriage. There are two other contemporary portraits which have been claimed to be of Lucrezia, both painted by Bartolomeo Veneto, and otherwise unidentified. Bartolomeo Veneto (fl 1502–1555), Portrait of a Young Lady (c 1500-10), oil on wood, 55.5 x 44.2 cm, The National Gallery (Salting Bequest, 1910), London. Courtesy of and © The National Gallery, London. Veneto’s early Portrait of a Young Lady probably from about 1500-10 has been thought to have a Ferrarese origin, and one of the beads worn by her is inscribed ‘SAP’. Her hair is not blonde, and she is here dressed in quite sombre clothing bearing emblems of the Passion. 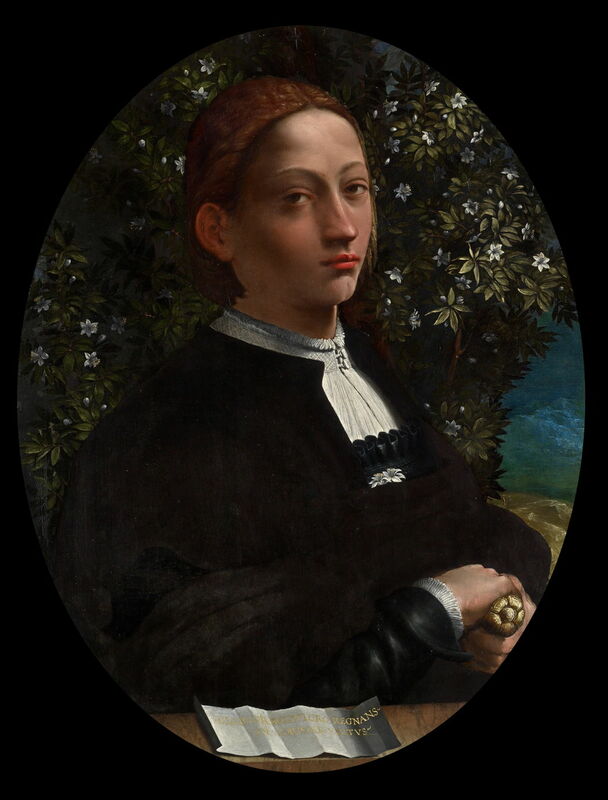 If the dating of this work is correct, Lucrezia would have been in her twenties when it was painted. The second of Veneto’s paintings which has been claimed to show Lucrezia is more scandalous, and was probably completed shortly after her death. 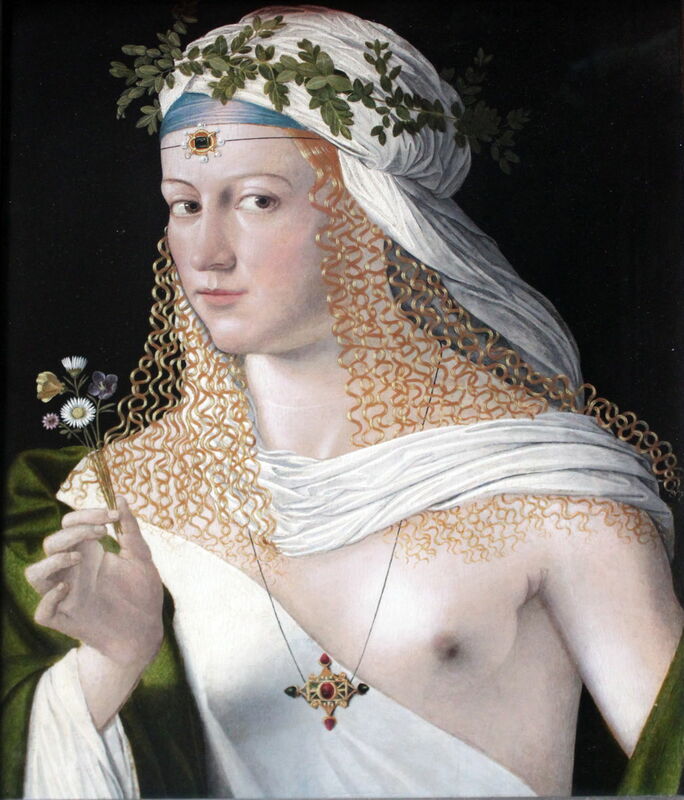 Known as an Idealised Portrait of a Courtesan as Flora (c 1520), it does at least show a blonde at last, but the Duchess of Ferrara exposing her left breast? Had those been the only paintings possibly of Lucrezia Borgia, she would hardly have made her mark in art. 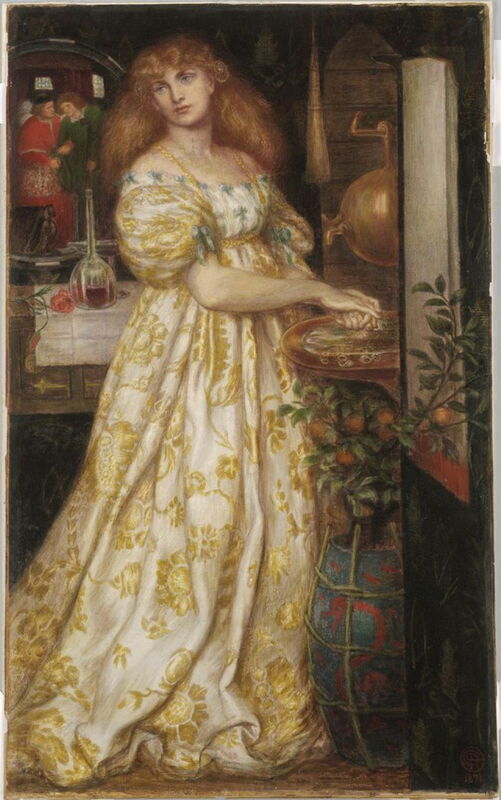 But Dante Gabriel Rossetti developed an obsession with her, and revived her image on several of his watercolours in the late nineteenth century. Dante Gabriel Rossetti (1828–1882), The Borgias (1851), watercolour, 23.1 x 24.7 cm, Tullie House Museum and Art Gallery, Carlisle, England. Wikimedia Commons. 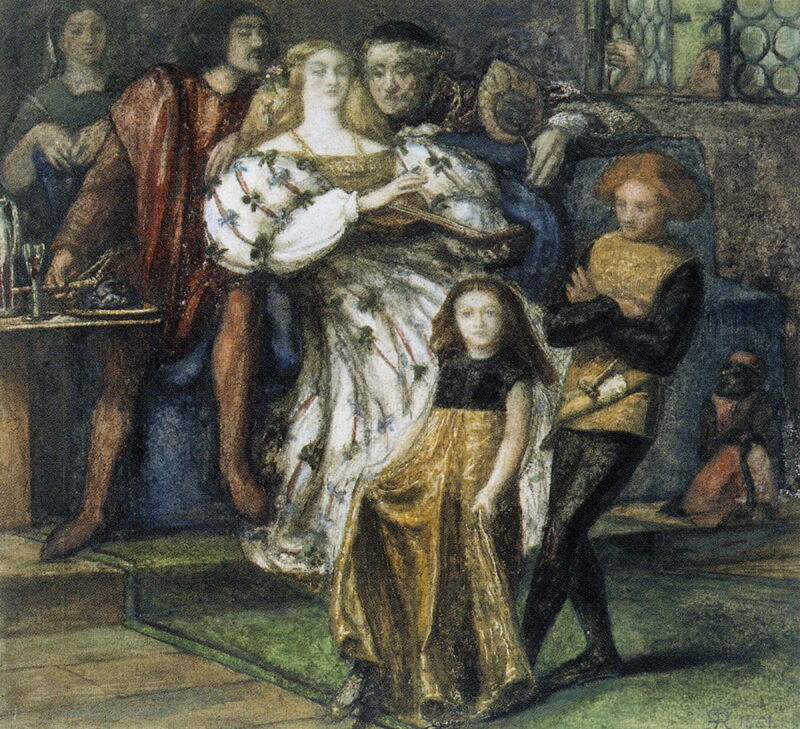 In the first, The Borgias painted in 1851, Rossetti has Lucrezia playing a lute in the midst of her family, two of her children dancing in front. All the figures look disturbingly sinister, particularly the man leaning on her right shoulder. In 1860, Rossetti returned to her when his interest in her family was rekindled. In Lucrezia Borgia (1860–61), he shows Lucrezia washing her hands in a small sink after she has poisoned her husband Alfonso d’Aragon in 1500. Shown in cameo, in a reflection in the upper left, are Lucrezia’s father, the Pope, helping her husband to walk in order to hasten the effects of the poison and bring about his death. 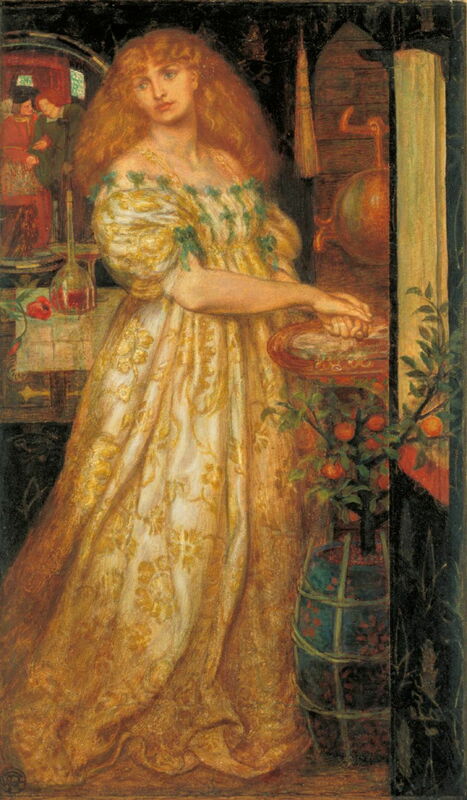 Rossetti revised her face at a later date. Ten years later, in 1871, Rossetti returned to this same scene and composition, and painted Lucrezia Borgia again. The only minor change which he made here is the decoration on the tall pot under the sink. Among Lucrezia’s children who survived to adulthood, one was the Duke of Ferrara for over fifty years, a second became Archbishop of Milan, and another – Leonora d’Este – was a nun and probably composer of religious motets. Members of the d’Este family, particularly Isabella d’Este, the wife of Lucrezia’s lover and brother-in-law Francesco Gonzaga, were major patrons of art in the Renaissance. Isabella was patron to Bellini, Leonardo da Vinci, Mantegna, Perugino, Raphael, Titian, Correggio, Dosso Dossi, and others. Posted in General, Life, Painting and tagged Borgia, Dossi, painting, Pinturicchio, Rossetti, Veneto. Bookmark the permalink.